These are just a few of the many ingredients that go into every one of the different active adventure vacations Holiday offers. In addition to the above ingredients we recognize the vital role you as a Travel Agent can play in introducing your clients to us. Holiday River Expeditions has taken guests to the West’s most spectacular landscapes, in grand style, for more than 48 years. The fact that more than two-thirds of our business comes from repeat and referred clients speaks to the quality trips that we operate. We value your service and offer a generous commission for our Utah rafting and Mt. Biking trips on both our regular and group/family rates. Our Idaho, Grand Canyon and Baja, Mexico trips are non-commissionable. If you provide over 20 guests in a season, you qualify for a significant higher level of commission. Also, we offer familiarization trips to qualified agents at an unpublished discount rate on Utah rafting and biking trips. Please note that this discount does not include sleeping rental kits, bike rentals, government fees and taxes. If you have further questions please feel free to contact us at 1-800-624-6323. 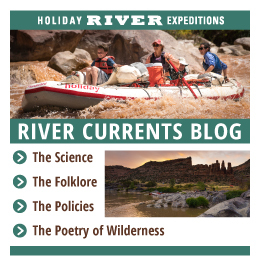 We know your clients will be very pleased with their river or bike vacation with Holiday River Expeditions and we look forward to working with you and your organization.